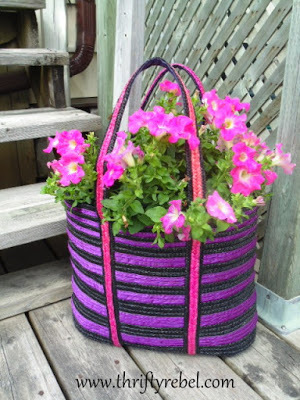 I love to make planters out of unusual things, and a thrifted purse planter is a quick and easy way to add some fun to any garden deck or patio. I shared this large thrifted $1 tote bag purse in this Thrifting Pink post a while back, and I mentioned that it was destined to become a purse planter. Well it’s date with destiny finally arrived. 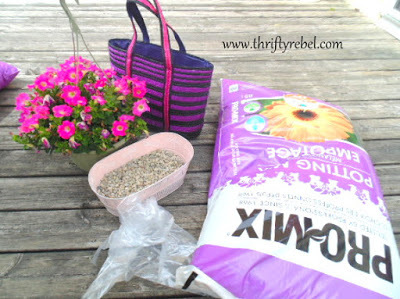 Besides a large purse or tote bag you’ll need some pea gravel, a plastic bag the size to fit in the purse (I used a clear kitchen catcher), some potting soil, and your flowers of choice. I chose pink (of course) petunias in a hanging basket because they were on sale, and this makes planting very quick and easy. 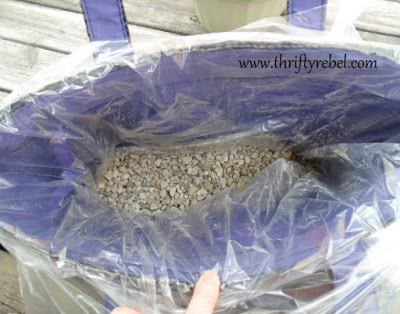 I lined the inside of the purse with the plastic bag and added about 2″ of pea gravel. This allows some water to drain away from the soil and it gives some weight to the planter so it won’t be blown over on a windy day. Then I added the potting soil. 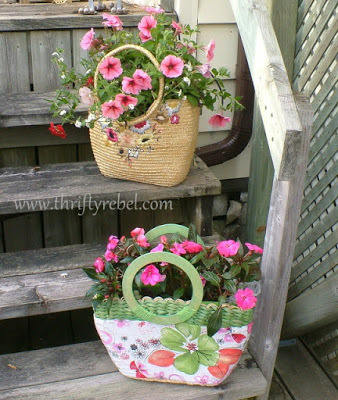 I removed my petunias from the hanging basket and placed them into the planter. I filled any gaps with more potting soil. Then I tucked in the plastic so it couldn’t be seen. 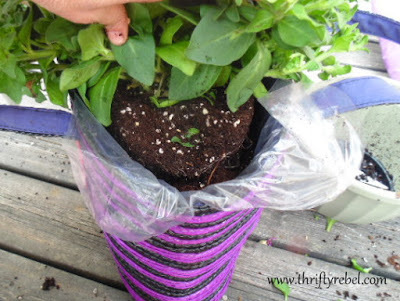 I always water my purse planter with a single spout watering can so I can get the water into the soil without it spilling all over the outside of the purse. And if I think it’s going to rain I move the bag under one of our patio tables to protect it from getting wet. This just helps the bag last longer. I made these two purse planters back in 2013. They only lasted the one season, and were quite done by the time fall arrived. I will admit that I may have forgotten to move them when it rained a few times. This one is a painted and coated wicker so I’m hoping to get two gardening seasons out of it, but we’ll see how that goes. Even if these purse planters don’t last forever they’ll add a touch of fun to wherever you put them, and they’re so quick and easy to put together. 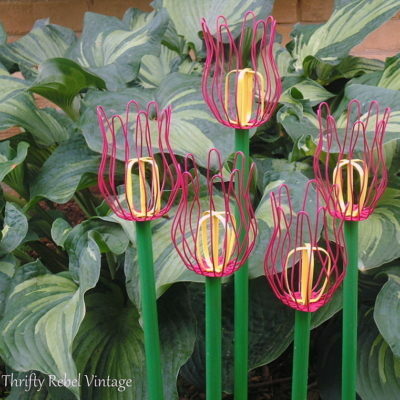 If you enjoyed this project you can find more garden decor projects here. Oh, I love this Tuula! Such a unique idea to display lovely flowers! And I like this purse most of all! You know it looks more purple than pink to me! I wonder if spraying the purse with a sealer would make it last longer? In any event, it's really gorgeous with the petunias no matter how long it lasts! Very cute, unique idea! I see those totes at thrift stores all the time so it would be fun to change them out every year. I also like the idea of the pea gravel….using broken pieces of clay pots is not working for me anymore! I just love these Tuula! So creative and pretty! So pretty! I bought a little moss purse planter a couple of weeks ago. It's actually being shown on my latest post. Great and thrifty idea! A few of my patio ceramic pots cracked and broke in the winter cold this year. I like this pretty and unique idea, even if they only last a season. Will definitely try it, thanks! Glad you are finally warm Tuula! What a wonderful idea! I love how these turned out. 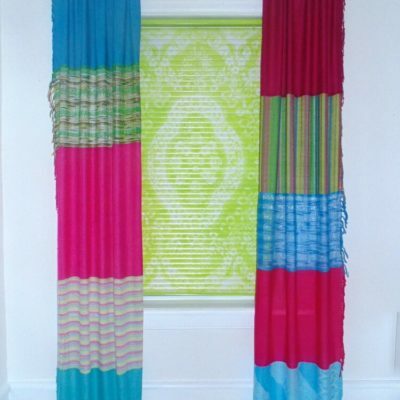 This is such a cute idea, and now I know how to make one. Yours turned out so pretty. 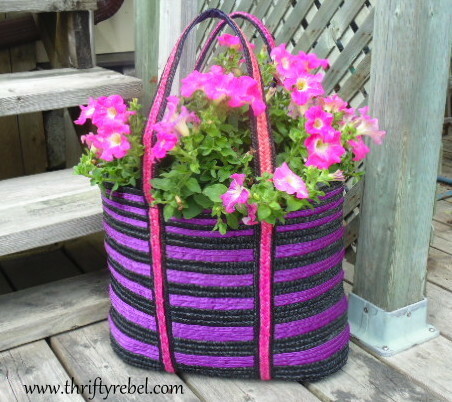 The purple and pink together would brighten up any yard or patio. Pinned!! I have always adored your purse planters, sweet friend. You are so talented and creative! 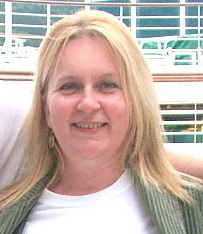 Thanks for sharing your loveliness and charm with Roses of Inspiration. Happy weekend! Thanks Lorelai! And thanks for the invite to the party. The purse is perfect for petunias. Love all the pinks! Super cute idea Tuula! I love using anything unexpected as a planter and a purse certainly is unexpected! Thanks for sharing with SYC. Great idea! 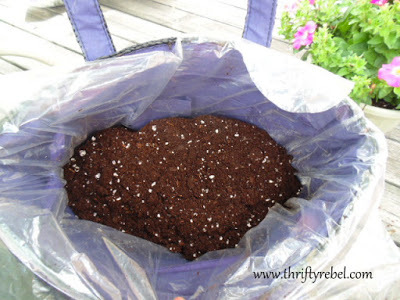 I have an old bag or two that could be repurposed this way. I'll have to dig them out. They're getting too worn to carry, but still cute and I just love this idea. Thanks for another great idea. Thanks so much Sheila! 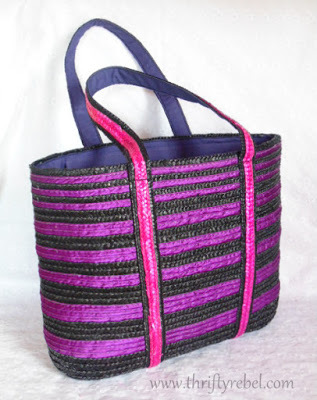 This is a great way to use those bags that we still love, but that we can't be seen with out in public anymore. lol. Wow Tuula what a great idea! They are so pretty & brighten everything. Thanks for the idea! I’ve never seen this idea! How cute! Looks like something I’d like to try too, so I will be on the lookout for a cute tote bag!